DxChain(DX) Trading Competition: 40,000,000 DX! Users will be ranked in terms of the total DX volume traded on KuCoin (including both buys and sells) across all DX trading pairs during the competition period. 1. TOP 5 Traders: 8,000,000 DX in total to win! The top 5 accounts with the highest trading amounts of DX (buys +sells) on KuCoin will win a share of 8,000,000 DX rewards in proportion to their trading amount. 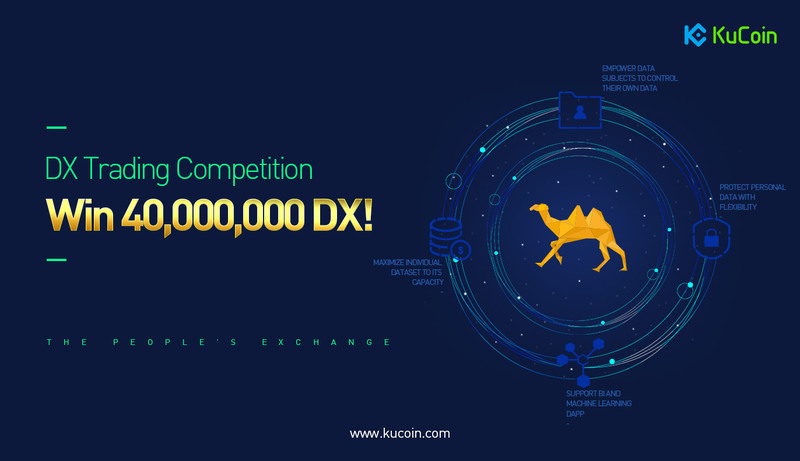 If you enter the top 5 according to your DX trading amount during the competition, with a transaction volume of 10,000 DX and the total transaction volume of the top 5 users is 100,000 DX, your reward proportion will be 10%, which would be 800,000 DX. 2. TOP 6-200 Traders: 32,000,000 DX in total to win! Participate in trading DX on KuCoin during the competition. Top 6-200 accounts with the trading amount of DX (buys +sells) on KuCoin will share 32,000,000 DX as rewards! *Note*: KuCoin will update the latest trading competition rankings before 16:00 every day from Mar 26, 2019 (UTC+8). KuCoin reserves the right of final interpretation of the competition. KuCoin will screen and analyze all trading accounts involved in these promotions before making the final decision of who the rightful winners are. Those users involved in competition manipulation will be disqualified. All rewards will be distributed among those traders who do not participate in these types of manipulative tactics. CRO Holdings Competition, 2,000,000 CRO to Give Away!